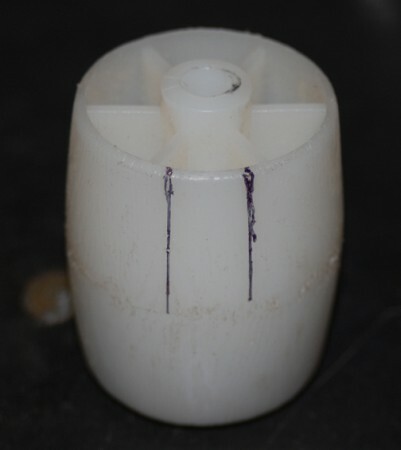 The following guest post was written by Ron Horner, a Photographer and a DIYer extraordiner. This morning my employer came into work and wanted my help in doing a portraiture shoot of his daughter and her family this afternoon. Of course I agreed as he is a rank amateur and needs all the help that he can get with his Nikon D80 and SB600 flash. I thought that it would be a simple one light bounce flash shoot but when he showed up three hours before the shoot with a new umbrella and wanted lessons on studio photography at the same time, things got interesting. He had only bought the umbrella, no umbrella holder or stand and had no idea about what was involved. The stand was no problem, I just had to make a short drive across the city to get my tripod but the holder was a different proposition. A few quick phone calls to every shop in town revealed that a holder was not going to be a purchased item as nobody had one in stock but one store and I was not going to pay $60 for it. A quick search for something suitable concluded when I found a wheeled castor from a bed frame. 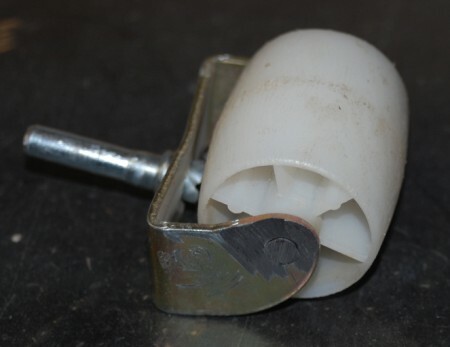 It was made out of plastic so it would be easy to work with and the axle hole would work to hold the umbrella shaft. First thing to do was to grind off the end of the axle to take it apart. 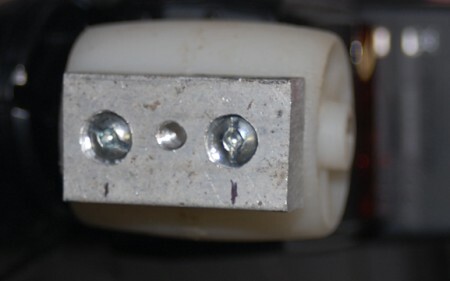 A couple of quick measurements showed that the wheel could be trimmed to accept the hotshoe of the flash with some careful filing to remove the crown on the wheel. After marking where the cuts would be made, I used my dremmel tool to cut the outer side of the wheel and to slot the reinforcing webs to make room for the flash foot. I rough shaped it with the dremmel and then used a flat file to smooth things out a little. After a few trial fittings, I got the opening to fit the flash and hold it securely. The axle hole was too small for the umbrella shaft so a quick drilling was required and the shaft had a nice solid friction fit after this. Now, how to attach this unit to my tripod. I hunted around the shop and finally found a 1/2 X 1″ piece of aluminum bar stock. 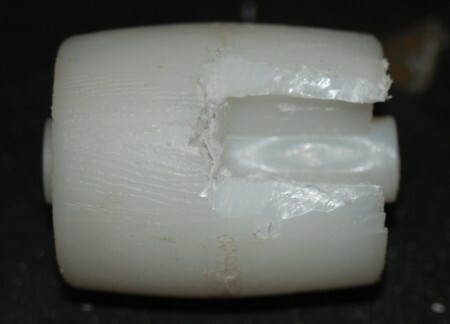 I cut this to a length of 1 ¾” and drilled 2 holes to accommodate a #10 machine screw for fastening to the wheel. 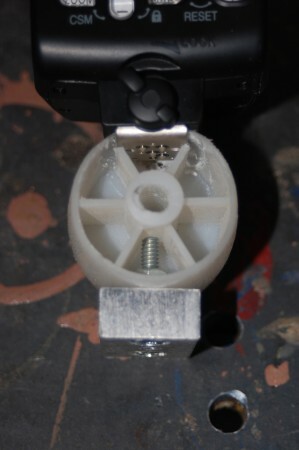 I then drilled and tapped a hole in the center to accept the ¼” bolt on my tripod. I filed the side of the wheel opposite of the flash foot opening so that it would sit flat on the piece of aluminum and then attached it to the wheel with the 2 #10 screws. 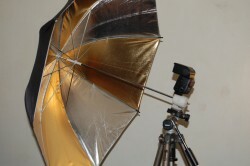 I placed the holder onto my tripod, placed the umbrella into the center hole and stuck on the flash. It was not pretty, but it worked and I still had 20 minutes to go before the shoot.